Many parents come to see their kids walk across the stage during their moving up ceremony because this significant milestone also signifies their achievement as a parent. That’s exactly what this proud father did when he rushed from work to attend her daughter’s junior high school graduation. With no time left for him to change his clothes, he went straight to the venue wearing his uniform as a soldier. While many people admired the father for what he did, there are also some who criticized him for attending his daughter’s moving up ceremony in military uniform. 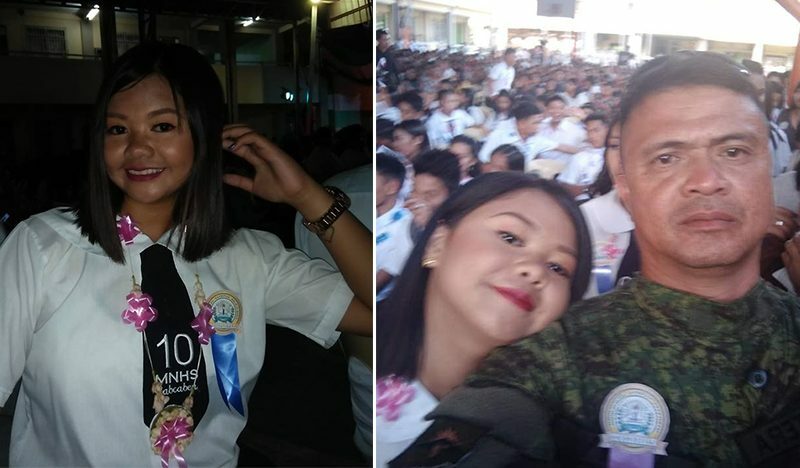 On April 4, Rashian Erica Dematera shared a post on Facebook explaining that his father went to her school at Mariveles National High School in Bataan straight from his duty in Nueva Ecija. Because her father was very tired from his work, he no longer changed his current uniform and chose to go straight to the school’s ceremony. “Para sa lahat nang nagtatanong kung bakit naka uniform pangsundalo si papa nung moving up ko at sa sa isang tao na nagsabi na pasikat ako. Para sabihin ko sa inyo na galing sa duty si papa at galing pa siya sa Nueva Ecija para lang makapunta sa moving up ko. Hindi na siya nagpalit ng damit dahil pagod siya,” she said. The young student heard one lady, referring to them as ‘pasikat.’ However, she clarified that her father did not want to gain attention, because all he wanted is to show his support for her. “Di yon pagpapasikat, pagpapakita yon ng pagmamahal ng isang ama, na kahit gaano siya ka-busy na protektahan ang bayan, handa pa rin siyang maglaan ng oras sa anak at pamilya niya,” she added. As of this writing, the post has reached more than 200,000 reactions and 30,000 shares on Facebook. Many netizens have shown their support and praised her father for what he did.